This is a repost from this past January. Oh Qazse that is quite devastating. But lovely. The close is powerful and sad. When we cut our tree down, our 8 year old was upset about it, like your poem. i could see her point, but i never thought of the tree as abandoned, like you’ve shown in the poem. My family and I go through the tree debate each year and I am always out-voted. I can assure you we will have a tree. 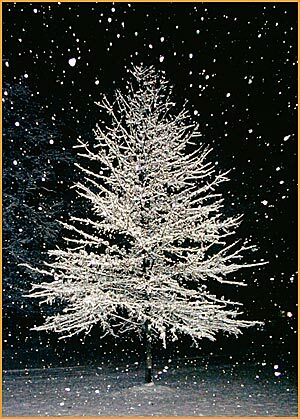 According to the National Christmas Tree Assoc., Americans spent 1.2 billion dollars on real Christmas trees last year. I am sure that 1.2 billion is a minuscule amount of the total Christmas expenditure each year. However, I do think we must question the costs of our traditional luxuries in the face of grave need in this world. Christmas has become synonymous with Gluttony rather than Godly. I picked on the poor Christmas tree because it is a symbol as sacred as apple pie. I think we must question our actions instead of blindly following the Martha Stewart brigade at the expense of the poor and the environment. I don’t want to bring on guilt, just questioning. Thank you both for being in my blogging life. I will think of you both fondly when I raise my glass of ale to toast our tree. Warmest regards and wishes to you and your families!